Spring Lake Borough Hall is located at 423 Warren Avenue, Spring Lake NJ 07762; phone: 732-449-0800. The borough was incorporated in 1892. 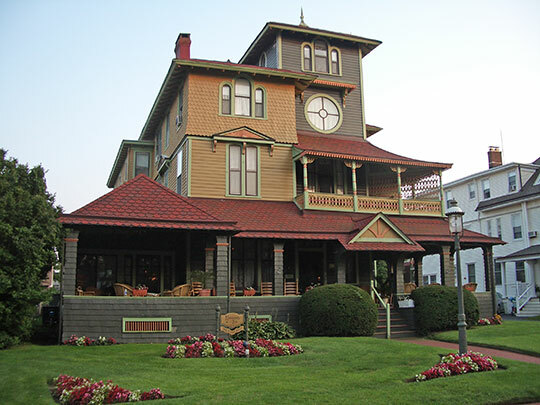 The Spring Lake Historical Society Museum is located at 423 Warren Avenue. Photo: Audenried Cottage, ca. 1909, 21 Tuttle Avenue, Spring Lake, NJ. Listed on the National Register of Historic Places in 1991. Photographed by User:Dmadeo (own work), 2008, via Wikimedia Commons, accessed August, 2013. The Town of Spring Lake was the subject of a study by the Historic American Buildings Survey in 1991. Portions of the text below were adapted from a copy of the resulting HABS documentation. [†] Adaptation copyright © 2010, The Gombach Group. During the 1870s-1880s, the railroad reached southern Monmouth County, signaling the opening of the shore to more extensive resort growth. Spring Lake's development, initiated during this time, is representative of the resort speculation that occurred as a result of the increased access to the New Jersey shore. Spring Lake actually began as four distinct shore communities — Brighton, and North Brighton, Villa Park, Spring Lake Beach (named for the fresh-water pond its streets enclosed), and Como, at the north end of the tract. Each of these settlements grew from one or two large farms into a village centered around a hotel and a railroad station. The land sat undeveloped under a string of owners from the 1760s, but during a relatively short time in the last quarter of the 19th century it was subdivided, sold off, and built up. The farmland, dunes, and forests adjacent to the Atlantic Ocean between Lake Como on the north, and Wreck Pond to the south, were carved up by an urban grid pattern of streets. In 1872 William Reid and John Rogers, owners of a prominent stagecoach business who foresaw that their enterprise would be rendered obsolete by the coming railroad, converted their farm property near Wreck Pond into Rodger's Villa Park and Reid's Villa Park. The properties were later combined into a single Villa Park. In 1873 two entrepreneurs, Joseph Tuttle and William Reid, surveyed the Walling Farm, establishing building lots for the future resort of Brighton. As Brighton grew, it was briefly divided into Brighton and North Brighton. In 1884 Brighton, North Brighton, and another farm subdivided by Tuttle, were incorporated as North Spring Lake. The effect of such exclusiveness, was to create beautiful, comfortable, and enduring neighborhoods, for those who were allowed to afford it, excluding blacks and a number of other ethnic groups. In 1900, Monmouth House, along with four other hotels burned in one of the fires that routinely devastated the Jersey Shore's matchstick buildings. Spring Lake endured, however, and remained prosperous in the 20th century as trees and gardens matured and more modern Colonial Revival and American Foursquare houses sprouted on remaining vacant lots. The merging of the four developments into a single entity in 1903 provided Spring Lake with the required funds for police and fire protection and for maintaining lighting, streets, sidewalks and sewers. Today, Spring Lake obviously continues to receive adequate civic funding. Unlike the sprawling shore resorts that require automobile transportation, Spring Lake has retained its quaint commercial center's original pedestrian scale. Located between the railroad tracks and the shore, it has been exempt from the development pressures or erosion of character from heavy traffic as other main streets. Since there is no competing shopping mall in the area, the genteel residents immediately surrounding Third Avenue have continued to patronize it, often walking to the shops, helping the street remain economically viable and out of the hands of traffic engineers. Today, Third Avenue retains an eclectic low-scale collection of business blocks, with such details as angle parking and square-cornered curbs reminiscent of an era after the automobile but before the superhighway. The dignity of the waterfront has been preserved, where instead of glitter and games, the boardwalk remained almost two miles of pure "walk" among the dunes, anchored on each end by two luxurious 1930s beach pavilions. Designed by architect E. Henry Schmeider, then Spring Lake's municipal engineer and architect,  the pavilions are still in use today. The north pavilion, the most intact of the two, has wide hipped roofs which serve as a visor over an observation deck located above ground-floor changing rooms. In the rear, the original salt-water swimming pool remained in use, flanked on either side by open-air wings where sheds of private lockers are set up in rows. In its public spaces the building is decorated with terra-cotta art plaques depicting sunsets, lighthouses, birds and other maritime imagery. Other historic structures, which pre-dated the beach pavilions, and many houses remain, but in a state of flux. The palatial, Colonial Revival-style Essex & Sussex Hotel remained so true to its original design as late as the 1970s that it was used to create an Atlantic City scene in the motion picture Ragtime. A conversion to condominiums in the 1990s, however, brought dramatic alterations; porches were made into living space, details removed, shrubs and landscaping destroyed, and with nary a rocking chair it seemed a different and apparently empty place. A few blocks away, at 115 Monmouth Avenue, the more modest 1890 Shoreham Hotel fared better, restored in the 1980s to something resembling its former glory. Spring Lake's Victorian elegance is epitomized by Green Gables, a private home on Ocean Avenue equipped with two croquet lawns, which was the "first such club on the Eastern seaboard." Also Victorian is a stroll around Spring Lake itself, a scenic tree-lined walk with shortcuts across two rustic footbridges built by hotel owners in the late 19th century. Besides the requisite ducks, minnows and turtles, walkers enjoy views of several hotels, mansions and St. Catherine's Church. Charles D. Wrege, Spring Lake, A Resort of Elegance in Monmouth County, New Jersey, (Spring Lake, NJ: Spring Lake Bicentennial History Committee, 1976), 13. H. C. Woolman and T. F. Rose, Historical and Biographical Atlas of the New Jersey Coast, (Philadelphia: Woolman and Rose, 1878; reprint, Toms River, NJ: Ocean County Historical Society, 1985), 217. Gustav Kobbe, New Jersey Coast and Pines, (Short Hill: by author, 1889; reprint, Baltimore: Gateway Press, 1977), 54. "Pavilion Tiles tell Intriguing Tale of Spring Lake Yesteryear," The Herald Extra, (August 16, 1989), B1. Judith Zinis, "Spring Lake: Splendor On the Shore," The Washington Post, (September 25, 1988), E1-E2. Gail Hunton and James McCabe, Monmouth County Historic Sites Inventory Summary Record, (Lincroft NJ: Monmouth County Parks System, 1984, reprint, 1990), 49. Essex & Sussex Hotel, postcard (Point Pleasant NJ: American Post Card Co., nd). † Alfred Holden, HABS Historian, Town of Spring Lake, Historic American Buildings Survey, HABS NJ-1010, 1991.